FILE - An Eritrean soldier carries his rifle and teapot as the Eritrean army begins to pull out from the frontline near Senafe, Feb. 17, 2001. The Eritrean Ministry of Information issued a statement Sunday accusing the Ethiopian government of launching a military attack against the country. 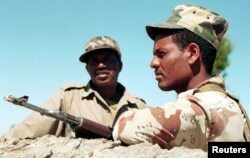 Ethiopia denies initiating the attack, accusing Eritrean forces of prompting a counterattack by Ethiopia. The brief statement from the Eritrean Ministry of Information said the attacks occurred on the Tsorona Central Front. Tsorona is a village located near the border, a little over 35 kilometers from Adigrat, an Ethiopian town in the Tigray region. Ethiopian Communications Minister Getachew Reda said Eritrean forces from around the Tsorona region made unusual, aggressive movements, eliciting a response from the Ethiopian side. He denied it was a significant battle. “It’s just a skirmish because Eritrea’s side moved in a fashion that is unusual under the circumstances because it’s been a long time since Eritrea’s regular army even ventured outside of their ditches, their trenches,” Reda told VOA, speaking from Germany. Reda confirmed that Ethiopian authorities have asked civilians to evacuate or seek shelter due to artillery fire. “The Eritrean artillery units are making indiscriminate bombardment of the area so it will be a very responsible move for us to tell some of our people, especially those who are close to the border, to evacuate, not to evacuate in a sense of leaving their village but to a safer area,” he said. FILE - Two Eritrean soldiers keep a watchful eye on the disputed Eritrean/Ethiopian border from a vantage point on top of Eigar Mountain, near Tsorona, Eritrea, Jan. 25, 1999. Eritrea and Ethiopia fought a border war from 1998 to 2000, with significant fighting occurring between the towns of Tsorona and Zalembessa. Thousands died, and animosities continue to this day, with a heavy military buildup along the unmarked border. When the war ended, the international community formed a boundary commission to delimit and demarcate the countries’ shared border. The commission was responsible for issuing a final ruling after hearing each side’s border claims. Both sides agreed to abide by the 2002 ruling of the Eritrea–Ethiopia Boundary Commission (EEBC), but Ethiopia stonewalled after the border had been defined. The border has never been demarcated, and it remains a source of tension. A map delineates past areas of conflict between Ethiopia and Eritrea. The incident comes in the wake of a June 8 United Nations report accusing Eritrean leaders of committing crimes against humanity.